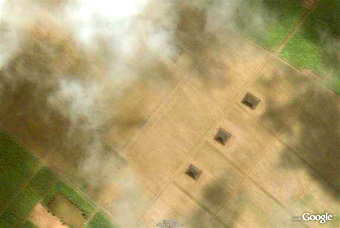 Seven pyramids have been identified on the African island of Mauritius. Remarkably, they are identical in construction to the ones found on the island of Tenerife, an island on the opposite side of the continent. This underlines the likelihood that one civilisation travelled to various islands off the coast of Africa and built all these structures. The island of Mauritius is part of the Mascarene Islands and is in the Indian Ocean, about 900km (560 miles) east of Madagascar. The island is 61km long and 47km wide, and lies just north of the Tropic of Capricorn. In origin it is volcanic. The historical record shows that the island was known to Arab and Austronesian sailors as early as the 10th century; Portuguese sailors first visited in 1507. 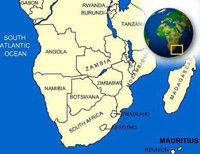 Mauritius was first plotted on a map made by the Italian Alberto Cantino in 1502. This planisphere identifies all three Mascarene islands (Reunion, Mauritius and Rodrigues) and calls them by their Arab names of Dina Margabin, Dina Harobi and Dina Morare. It is surmised that prior to the Arabs, Mauritius was known to people living on the African coast as well as to the famous Sea Peoples, a confederacy of seafaring raiders that included the proto-Phoenicians. The Greek account of Periplus relates the story of Hanno (Hannan), the Carthaginian navigator who lived in the 5th century BC, and who traversed the Pillars of Hercules (the Straits of Gibraltar) in command of ships going to explore the Atlantic coast of Africa. Herodotus describes a Phoenician expedition leaving the Red Sea and traversing the "sea of the south", and, following the orders of the Egyptian Pharaoh Necho II (610-595 BC), returning to the Mediterranean Sea through the Pillars of Hercules, which means they must have circumnavigated Africa. The seven small pyramids that have been identified are located on the south side of the island, in a plain known as the Plaine Magnien, between the Indian Ocean and Mont des Créoles and Mont du Lion, at 20°26'.8.15"S and 57° 39'2.60"E. Their foundation is rectangular and in height they do not exceed 12 metres; they have between 6 and 11 terraced steps. 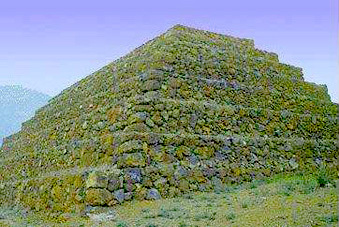 In appearance, they are similar to the pyramids located on another volcanic island off the western coast of Africa, Tenerife; similar structures also exist on the Mediterranean island of Sicily, which is also volcanic in origin. 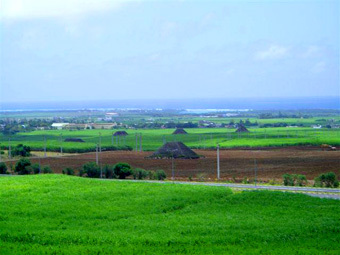 There are many parallels between the pyramids of Mauritius and Tenerife. On both islands the pyramids are part of a complex, grouped together in one location. On both islands they are made from lava stone without the use of any mortar or other binding agent. 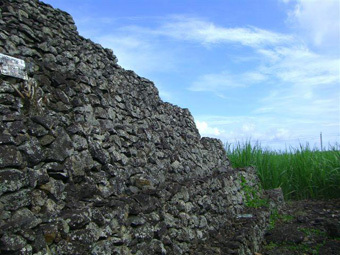 Some of the structures on Mauritius have been partially dismantled and the stones reused nearby. On some, an outer layer of basalt stones overlies blocks of an unusual type of limestone, no doubt of coral origin. Pyramid 1 with badly restored steps. 3 of the 7 pyramids. The Tenerife pyramids equally do not surpass 12 metres in height, and detailed photographs of the terracing make it clear that one cannot distinguish between the pyramids on Tenerife or on Mauritius. 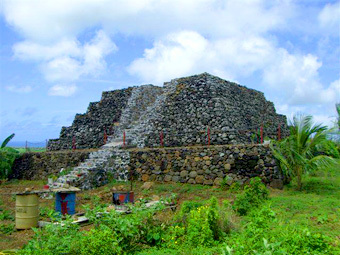 In the case of Mauritius Pyramid 1, access to the upper platform is via a central staircase. This has been restored in a whiter stone, and is therefore more visible. 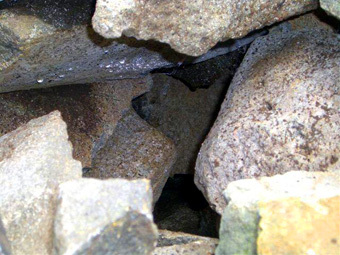 Not all pyramids have such an access – again like their Tenerife cousins. All this suggests that there is a commonality between the two islands that is beyond the coincidental. Mauritius Pyramids 3,4,5,6 and 7 Mauritius Pyramids 3, 6 and 7 ?? 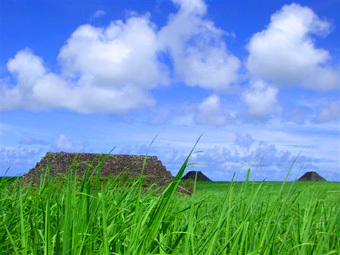 Some of the Mauritius pyramids, with their platforms, could have been used for astronomical observations. This too would be on a par with Tenerife, as in the Guimar complex. If so, these pyramids should be aligned to solar phenomena, and specifically the terraces should be aligned to the two solstices. Initial calculations suggest that this is indeed the case, though on-site verification needs to be made. Specifically Mauritius Pyramid 2 is likely to be aligned to the summer solstice (which in the southern hemisphere occurs on December 21) and one should be able to observe a double sunset. The first sunset would occur behind the Mont des Créoles, the second behind the neighbouring Mont du Lion. A double sunset behind a mountainous horizon is also a phenomenon observed at the Guimar complex in Tenerife. Tenerife pyramid, identical to those on Mauritius. Limestone blocks and granite under an outer layer of lava stone. 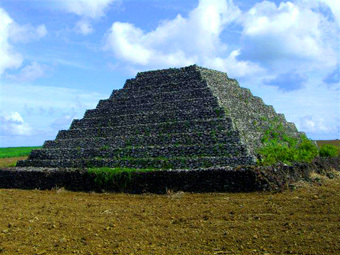 Locally, as Stéphane Mussard experienced, the people claim these pyramids are merely piles of stone thrown together in an effort to clear the fields for growing sugar cane. Even this is a repeat of the situation in Tenerife, where other complexes on the island (e.g. Icod de los Vinos) are explained by the locals as the result of farmers clearing their fields of unwanted stones. If this were true, why do some of the pyramids on Mauritius still have official panels, dating from the first half of the 20th century, which identify them as protected sites of historical interest? Sadly the sites have since lost their protected status, no doubt the consequence of a change in government (Mauritius was under British rule until 1968). 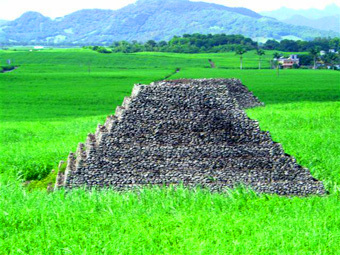 Maybe those who dismiss these pyramids as "piles of stones" are afraid to see their agricultural lands repossessed, or to have to conform to certain regulations that come with protected archaeological sites. It is nevertheless clear that with proper help, the government should be able to highlight the economic benefits of tourism to the local economy, which will hopefully result in scientific research carried out on the site. 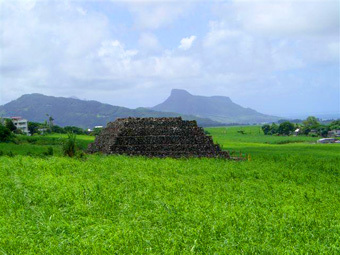 Mauritius Pyramid 2 with Mont des Créoles on the left and Mont du Lion on the right. Mauritius Pyramid 3 with 10 terraces and a larger base. The man responsible for the identification and promotion of the Guimar complex was Thor Heyerdahl, a pioneering sailor of Norwegian origin, who argued that our distant ancestors were able to navigate the oceans, and who organised various expeditions to prove his point. Heyerdahl found a pyramid in the Maldives, on Gan. This pyramid was aligned to the sun and measures 8.5 metres in height. It was named "Hawittas". Heyerdahl argued that the Maldives were located on an eastern maritime trading route that was used by various ancient civilisations, coming from the Middle East. The ancient Egyptians used the Phoenician fleet to carry out expeditions, and it is known that the Phoenicians constructed astronomical temples that were perfectly aligned to the cardinal points and to solar phenomena. With the discovery of identical pyramid complexes on Tenerife, Sicily and now Mauritius, it is clear that these are remnants of a seafaring culture that has left traces on islands on various sides of the African continent. One of the Hawitta pyramids in the Maldives. Syndication: The above article can be reproduced, provided Antoine Gigal is identified as the author and Histories & Mysteries is credited as the original source. All photographs are copyright Stéphane Mussard, copyright reference obligatory if they are reproduced.